DeLonghi 50 Pint Dehumidifier Review. 50 Pint Dehumidifier with Pump. 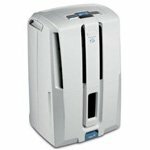 The DeLonghi 50 Pint Dehumidifier DD50P is an Energy Star® qualified, lower capacity dehumidifier recommended for controlling humidity in smaller spaces in the home. Unlike many other room dehumidifiers the DD50P is fitted with a built-in dehumidifier pump, or "condensate pump", of DeLonghi patented design. It is capable of operating safely at low temperatures although it is most suitable for areas where the ambient temperature remains above 60°F/16°C at most times. The 50 pints per day capacity of this dehumidifier was recorded under typical European test conditions of 32°C and 80% relative humidity. At the AHAM standard of 27°C/80°F and 60% relative humidity this rate is halved. As most dehumidifiers sold in the USA are rated at AHAM conditions this unit should be considered as a 25 pint dehumidifier when being compared with domestically produced brands, such as Frigidaire and Danby. This is a well featured dehumidifier and, in addition to the unusual feature of an internal dehumidifier pump, this unit includes an adjustable humidistat to maintain a constant level of relative humidity, a large, 14 pint, water collection container, auto-defrost, electronic controls, a washable air filter, two fan speeds, stylish design and compact dimensions. Dehumidifier reviews of this unit, written by consumers, are largely favorable and a large majority of users report being very happy with their purchase. This dehumidifer is a little more expensive than some other lower capacity units but this is justified by the inclusion of the internal dehumidifier pump. We judge this unit to offer value for money and are pleased to recommend it to our visitors for smaller areas and for use in vehicles, such as RVs, where its slim, compact design and the internal pump may be particularly valued. DeLonghi is one of Europe's leading dehumidifier manufacturers and supplies dehumidifiers to many countries. The DD50P belongs to a range of three models specifically tailored for the North American market. The DeLonghi 50 pint Dehumidifier offers three drainage options. Like all room dehumidifiers it can drain into the water collection container which can be emptied by hand, probably at least once per day. Also in common with most of its rivals it is equipped for continuous drainage into a nearby floor level drain using a gravity feed. This is effective so long as the drain is lower than the outlet port in the dehumidifier but quite often a convenient outlet can only be found at a higher level and a gravity drain will, of course, be useless. To overcome this the DD50P incorporates a condensate pump, of DeLonghi design, which can force the water up to 16' vertically to a suitable outlet. It is possible to purchase a condensate pump as a separate item for this purpose but this involves extra expense, typically between $40 and $80. In comparing this dehumidifier with other options it is necessary to factor in the additional cost of a separate pump when comparing prices. The DD50P is recommended by some suppliers for basements, in addition to use in other living spaces, and this feature could be an important factor for some purchasers when reaching their decision. Given its capacity this unit will only be effective in a small basement and most users will find a unit with a higher water extraction capacity more effective and more energy efficient. One application for which we believe this unit may be very suitable is as an RV Dehumdifier. For those who use their RV's in warmer temperatures only, the compact dimensions of this unit make it a very attractive proposition. The capacity of this dehumidifier is more than adequate for any RV. The condensate pump may also be an advantage in an RV, especially if the dehumidifier is being used while the RV is in storage. Another feature of the DeLonghi 50 pint Dehumidifier is the inclusion of an auto-defrost function. Those unfamiliar with dehumidifiers may not realise that because water vapor is removed from the air by condensing it onto cold coils ice can accumulate on these coils at quite high room temperatures, from 65°F or lower. Ice formation can damage the dehumidifier so the auto-defrost system stops the compressor to allow the flow of air to melt the ice. Obviously, the lower the ambient temperature the more quickly ice forms and the longer it takes to melt. The cooler it gets the more time the dehumidifier spends defrosting and the less effective it becomes. For this reason, although this dehumidifier can operate safely at temperatures as low as 41°F, it cannot be considered an ideal choice for areas which remain cool, below 60°F, for extended periods. The DeLonghi 50 pint Dehumidifier is portable and comes with caster wheels for easy movement on smooth floors and carrying handles located on the upper sides. At just over 41lb in weight the DD50P is not a feather-weight but manageable for most people. Its build is described in dehumidifier reviews by consumers as "solid" and "good quality" and it incorporates a condensate pump, which may account for its weight and may be thought to be a disadvantage worth tolerating for that reason. Other features of the DeLonghi 50 pint Dehumidifier include an adjustable humidistat, electronic controls, a washable air filter, a timer and two fan speeds. Dehumidifier reviews by consumers are very favorable for this dehumidifier. Users find this unit to be very effective and although some complain about the noise level the majority of reviewers find it quieter than other dehumidifiers they have used. The good build quality of the DeLonghi 50 Pint Dehumidifier is mentioned in a number of reviews and there are very few complaints about defects or poor reliability. Most have selected this machine, among other reasons, for the convenience of the built-in dehumidifier pump. The pump is reported to be effective and reliable. In contrast to many dehumidifiers the bucket is described as easy to remove and replace by those who use it. The only complaint we have noted is that the timer does not provide enough flexibility and simply switches the unit on and off before needing to be reset, rather than providing a programmed series of stops and starts. Our conclusion is that the DeLonghi 50 Pint Dehumidifier is effective, reliable, relatively quiet and offers advantages to users who require a built-in pump. It is entirely suitable for the smaller areas for which it was designed and would make a good RV Dehumidifier in warmer conditions, above 60°F. Applications for the DeLonghi 50 Pint Dehumidifier are clearly restricted to smaller areas but, if used within its limitations, this unit offers good value for money and we are pleased to recommend it to our visitors.